My secret career fantasy is to sell bar cookies on the local farmers market circuit. I can just see myself hawking misanthropic brownies and bella bars early Friday mornings as the sun slowly burns off the fog at the Venice Farmer’s Market. Then on Saturdays I’d move to Santa Monica or Playa Vista. Sunday would definitely be Brentwood. There’d be no store front, at least in the beginning. But, I’d do a brisk online business. I even have a name for the little operation (but I’m not going to tell). And while this truly is a fantasy (someone has to pay the homeowners insurance and keep the Kitchen Gods deep in kibble), I’ve always got my eye out for new bar and square recipes. In the name of research of course. 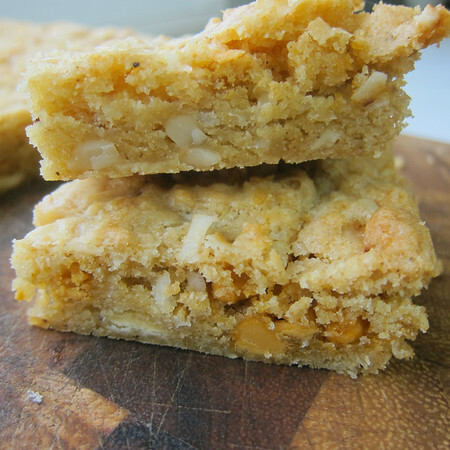 This one is inspired by the butterscotch blondie recipe in the newly published Lemonade Cookbook. Lemonade is an addictive southern California boutique chain that pairs seasonal ingredients with old-school cafeteria-style service. I’m embarrassed to admit there is a location mere yards from my office at USC but the anxiety of selecting what I wanted on the fly kept me from ever trying it while I worked there. Stupid for my tastebuds. Probably pretty smart for my wallet. In addition to the dozen or so creatively prepared salads–think watermelon radish and ahi or Israeli couscous and truffle oil–they also do decadent sandwiches and have a whole station of slow-cooked delicacies displayed in a rainbow of Le Creuset dutch ovens. Your tray-push ends in a display of house-baked treats and, of course, half a dozen varieties of lemonade. Don’t get me started on the cucumber mint. Even if you don’t live in L.A., Lemonade has a presence in the LAX Delta Terminal. I’ve never actually tried Lemonade’s butterscotch blondie in-store. But, they had me at coconut on the ingredient list. Like many kitchen-sink style recipes, this one begs for variation. Here, I swapped the pecans for almonds and the golden raisins for actual butterscotch chips. I’m also working on a holiday version that could make an appearance as a featured player in the Misanthropic Bake-a-palooza. *Obviously I think the last four ingredients are open to interpretation. 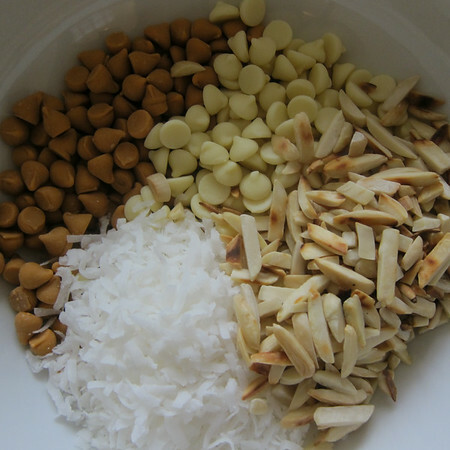 In this iteration I used butterscotch chips, white chocolate chips, toasted coconut and toasted almond slivers. Preheat oven to 350 degrees. Line a 9X13 inch pan with parchment and spray with non-stick cooking spray. In a small heavy-bottomed sauce pan add the butter and swirl it around over medium heat until is melts and foams. 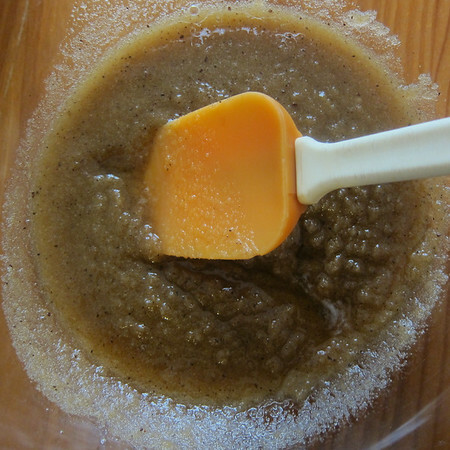 Continue to cook it gently until it is a brown-amber color and smells nutty (about 5 minutes). Add the brown and granulated sugars. Stir to combine fully. Remove from heat and let cool for 5-10 minutes. 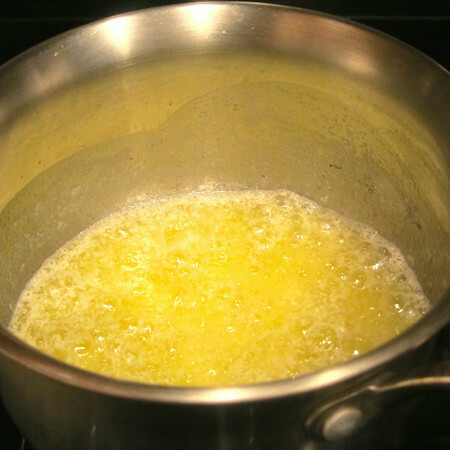 Add butter mixture to a large bowl, beat in eggs (you don’t need a standing mixer for this). Fold in flour mixture until just incorporated. Fold in remaining ingredients. 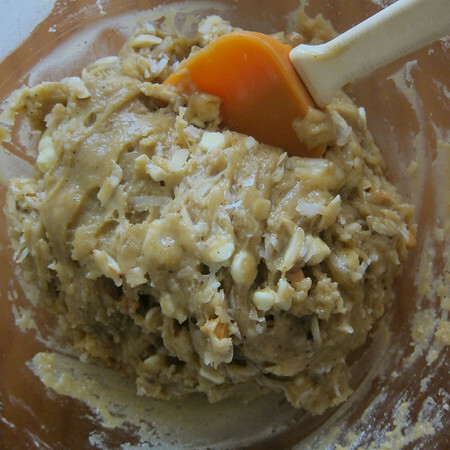 Pour batter into prepared pan smoothing the top with a spatula. Bake until the top is lightly brown and firm, 25-30 minutes. Cool completely in the pan on a rack. 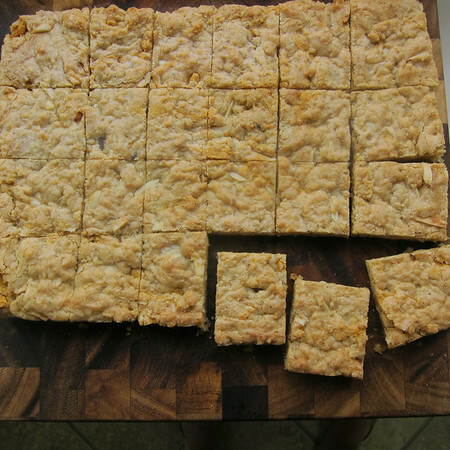 Cut into 2-inch bars.